Barack Obama will be among them, making the last push of his presidency to 'rebalance' Washington's foreign policy toward Asia, a strategy widely seen as a response to China's economic and military muscle-flexing across the region. The might of Laos' giant neighbor to the north is hard to miss in Vientiane: wealthy Chinese driving SUVs overtake tuk-tuks sputtering along the roads and Chinese-backed hotels sprout from noisy construction sites in one of Asia's most low-rise cities. But diplomats say Obama could be pushing on an open door in Laos, thanks to a change of government there in April. They say the country's new leaders appear ready to tilt away from Beijing and lean more closely toward another neighbor, Vietnam, whose dispute with China over the South China Sea has pushed it into a deepening alliance with the United States. "The new government is more influenced by the Vietnamese than the Chinese," said a Western diplomat in Southeast Asia." "It's never too late for a U.S. president to visit." Obama will become the first sitting U.S. president to visit landlocked Laos, where the United States waged a "secret war" while fighting in Vietnam, dropping an estimated two million tonnes of bombs on the country. About 30 percent of the ordnance failed to explode, leaving a dangerous and costly legacy. 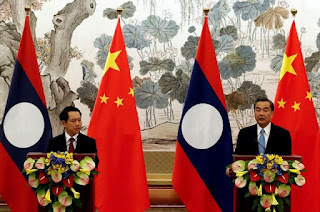 Laos has strategic importance to both Vietnam and China. Vietnam has a long land border with Laos that gives it access to markets in Thailand and beyond. For China, Laos is a key gateway to Southeast Asia in its "new Silk Road" trade strategy. Laos, which is developing a series of hydro power plants along one of the world's longest rivers, the Mekong, aims to become "the battery of Asia" by selling power to its neighbors. It is difficult to read policy in Laos because its leaders are so uncommunicative, but Western diplomats have detected some shifts. First, deputy Prime Minister Somsavat Lengsavad - who ran the steering panel for a $7 billion Chinese rail project - retired. The project is now believed to be on hold because Laos is unhappy with the terms of the deal. Officials of Prime Minister Thongloun Sisoulith's new government, many of them educated in Vietnam, have visited Hanoi en masse in recent weeks, their first foreign trip. At two of the past meetings of the Association of Southeast Asian Nations (ASEAN), which is currently chaired by Laos, Vientiane has taken a more nuanced stance on Beijing than neighboring Cambodia, which is increasingly seen as a Chinese satellite. "The U.S. strategic interest in Laos is to see the country be able to exert a certain degree of strategic autonomy because you don't want ... (to) have something akin to the relationship between China and Cambodia," said Phuong Nguyen of the Washington-based Center for Strategic and International Studies think-tank. A defense official in Washington did not comment on wider strategic issues but described Laos as "an important partner." A China foreign ministry spokesman said "we welcome any country, including those inside and outside this region, developing constructive relations, as long as these ties are really beneficial to regional peace, stability and prosperity." Beijing has invested around $1 billion annually in Laos in 2014 and 2015, a step up from the $4.5 billion invested historically before 2014, according to figures from China's Ministry of Commerce and state-run media. For the United States, impoverished Laos is not a strong investment draw. "In Laos, we bring 7-8 companies to the table compared with 30-40 companies that Vietnam brings. But China- that's a totally different ball game," said Anthony Nelson, director of the U.S.-ASEAN business council. "So there's no coincidence that the countries with the lowest levels of development, Laos and Cambodia, are the most willing to advocate for China's position in international discussions." But the Lao are closer culturally to Vietnam than they are to China. Their businesses use Lao language signs and mixed Lao-Vietnamese families incorporate local customs, while Lao-Chinese families tend to be isolated. "We are a bit frustrated with (China). They create their own eco-system," a Lao businessman said.